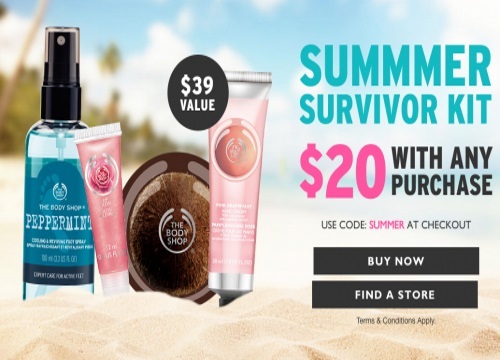 The Body Shop is offering a nice Summer Survivor Kit filled with must-have products to use this summer for $20 with any purchase right now! Kit includes Peppermint Cooling Foot Spray, Mini Pink Grapefruit Hand Cream, Mini Coconut Body Butter and Rose Lip Gloss ($39 value). Enter the promo code SUMMER at checkout to add this to your cart. Offer available for a limited time.